As state budget shortfalls soar, state governments are increasingly challenged to increase purchasing efficiencies by containing the costs of purchased goods and services and to critically assess their procurement functions and become more strategic in their category and vendor management efforts. Treya is a leading innovator in applying strategic sourcing techniques pioneered in the private sector, to public sector procurement. 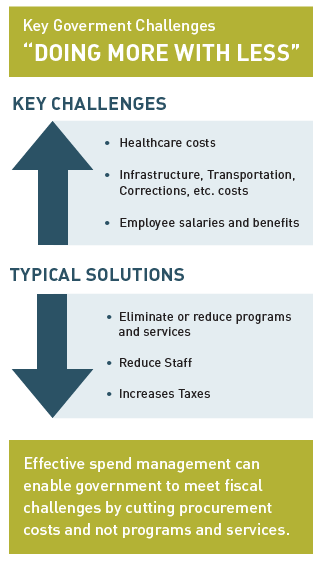 Our teams have helped over a dozen states in impactful cost reduction efforts. While the typical focus of these projects is cross-agency spend categories, we have also gainfully applied our expertise to numerous agency-specific spend areas such as environmental testing services, radio equipment, hearing aids, and commissary supplies. Treya has implemented strategic sourcing programs in over 11 states and is also a leading provider of strategic sourcing and procurement transformation services for the member states of the Western States Contracting Alliance (WSCA). Our approach typically includes an up-front spend analysis that builds a comprehensive understanding of the organization’s spending with external vendors and enables the development of a data-driven sourcing roadmap highlighting the savings opportunity. Our strategic sourcing techniques are uniquely tailored to the public sector procurement environment and prioritize stakeholder management and balance savings maximization with meeting key public sector procurement requirements. Post strategic-sourcing our approach focuses on implementation, compliance and savings monitoring, and contract and vendor management through a unique set of tools and techniques. We also provide procurement transformation services which effectively analyze all facets of procurement (organization, procurement code and rules, processes, technology, and strategy) and help develop an implementable road-map for transformation to a best-in-class procurement organization.